Udemy is a leading marketplace for online education. It offers over 80,000+ courses and you can find literally any course about anything. Buy courses on demand or signup for a business plan, if you’re a company, to get full access to all the premium and free courses on udemy site. The on-demand online learning platform offers a wide range of courses – from business to marketing, hardware to software development, personal development, law to health sciences, music to photography, and much more. By connecting students all over the world to the best instructors, Udemy is helping individuals reach their goals and pursue their dreams. Learn from zero, build up your career skills (even wordpress development), and propel them into a successful business. Check out below new seasonal promotions as well as traditional end-of-month offers from Udemy! Udemy April Savings: Courses for as low as $10.99! Unlock the best deals of April on Udemy and learn with courses for as low as $10.99 only. Apply promo code UDEAFFAS419 to reduce the cart price to $10.99. Calling all tech savvy professionals to join udemy for thousands of technical and professional development courses to boost career. 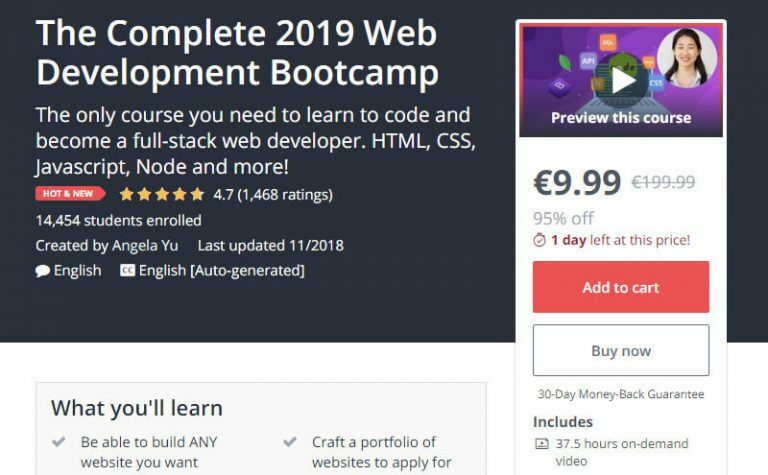 Apply promo code UDEAFFTB419 on udemy checkout page. Black Friday Sale! Buy any course for just $9.99 and get one free course on Cyber Moday! Visit Udemy.com on 23rd Nov. Buy any course of your choice before 24th Nov and get a free credit to buy another course on Cyber Monday, 25th Nov. Note, the credit will be valid for 2 days only so use it on time before it expires. If the price doesn’t reflect on the site, first clear your browser’s cache and then click on this offer link Limit one €9,99 credit per customer. Other exclusions apply. End of Nov Special, Top courses from $11.99 only! 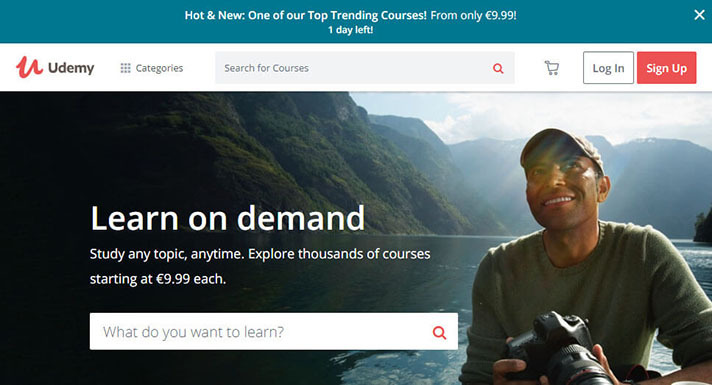 Enrol for any course on Udemy for $11.99 (90% OFF)! Use coupon code: AFFNOVEND18 on checkout and get instant access to your course from laptop or mobile, anytime, anywhere! Holiday Season! 90% off Udemy courses! Greetings from Udemy.com! Enjoy this holiday with super sale with upto 90% off! Use this promo link to get the discount. Conquer your career with Nikolaus sale! Nikolaus is here with courses for up to 90% off! Top photography courses from $10.99! Boost your photography skills and advance your career with top photography courses on Udemy starting from $10.99! Use coupon code AFFNOVPHOT18 on udemy checkout page. Use this coupon code to get 95% off on online courses. Please follow the instructions below on how to redeem udemy coupon code and get the best discount available on Udemy courses. We already mentioned in the beginning that there are thousands of courses available on their website. Browse through the top courses or narrow down the list based on interest of learning and/or topics you would like to master. Select the course you want to Buy. Here, on the course page, you will find more information about course and what you will learn through the course. Next, click on the Add to cart button. On checkout page, enter Udemy coupon code (verified) listed above and click on Apply button. I hope you find this coupon code useful and keep on coming back for more deals and discounts from Udemy.